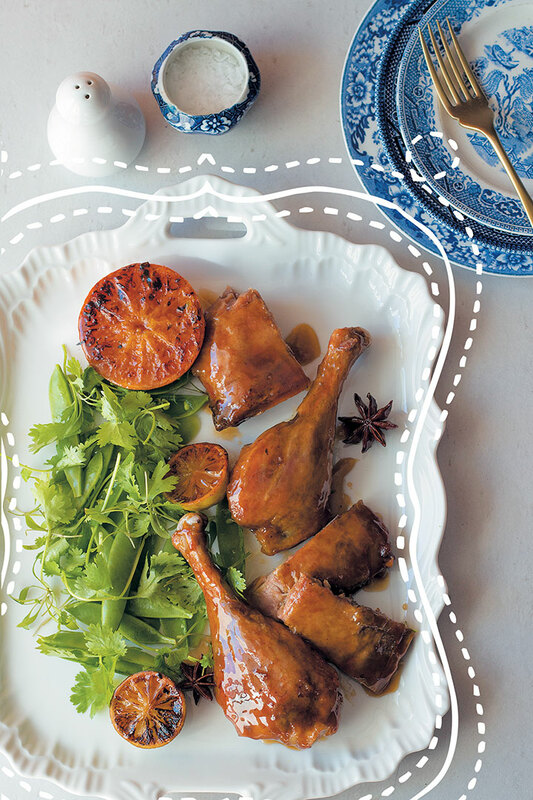 Orange and ginger-glazed duck with caramelised citrus is a wonderful dish for an elegant dinner or lunch. Don’t be intimidated – duck can actually be straightforward with this easy, delicious recipe. Season the duck portions well and place in a large roasting tray, skin-side down, with the halved citrus. Gently heat the preserved ginger pieces, syrup, star anise, honey and orange juice in a saucepan until combined, and pour over the duck portions. Place in the preheated oven and roast for 1 hour, turning the portions halfway and basting with the pan juices every 15 minutes until the duck is glossy and golden. Just before serving, squeeze the caramelised juices from the halved citrus over the duck pieces. Serve with sugar snap peas, fresh coriander and some of the citrus halves.